Found 23 holiday rentals in Pirin/Rhodope Mountains. Bansko Royal Towers Luxury Studio - 90 metres from Gondola! BEST VALUE RATES GUARANTEED !! RATES FROM £150 PEAK SEASON!! DISCOUNTED LONG-STAYS !! CLOSEST TO GONDOLA !! LUXURY SPACIOUS STUDIO APARTMENT WITH FREE WI-FI, FREE ACCESS TO SPA FACILITIES !! GREAT LOCATION, GREAT FACILITIES AT A GREAT PRICE !! If you are looking for a family friendly ski apartment in Pamporovo, Bulgaria then look no further. We can offer you a one stop shop for all your holiday needs, with personal service and advice in all areas of planning your ski holiday. Bansko Royal Towers is packed full of facilities and voted one of the best complexes for the amount of garden and outdoor space around the complex. The studio is the perfect place to relax after a day on the slopes and the complex has all you need. This 1st floor, 1 bedroom apartment with one balcony, sleeps four, it is furnished to a high standard with everything you would need for a comfortable stay. 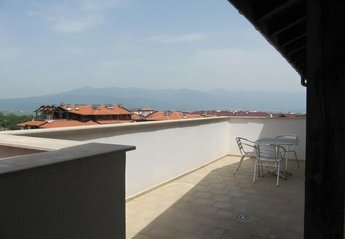 Lovely 1Bedroom Apartment (sleeps upto 4) in Bulgaria.FANTASTIC LOCATION & VIEW! Our Apartment, in Kosara Residence is a fantastic base to explore the Pirin Mountains any time of the year! The location is it's most unique attribute, it's a short walk to the Ski Road, which then allows you to ski directly to the Main Gondola. Our Ski and Summer Chalets provide affordable ski accommodation in Pamporovo, Bulgaria. The Belvedere is a fabulous complex of luxurious apartments offering a range of superb leisure facilities for your total holiday pleasure. Ideally located just a short walk to the gondola, ski & board hire, resturants, shops, bars and supermakets. A spacious and fresh one-bedroom apartment, which will comfortably sleep four – thanks to the double sofa bed in the lounge. Large master bedroom, ski wardrobe and balcony, as well as kitchen and lounge. This beautiful apartment is situation within a 3 mins walk to the main Ski Gondola and just a short walk into the centre of old town - a historic village with numerous local Inns and shops. Spa on site with indoor/outdoor pools and beauty salon. Sleeps 2-4 in 1 double bedroom and 1 double sofa-bed. Amazing location just 200m to the gondola. Luxury accommodation in 5* complex. From just £275 per week. Apartments with full spa facilities free onsite. 5 Minute walk to Gondola. 5 Minutes walk to the Gondola & right opposite the ski road Predela apartments of all sizes available. Furnished & fitted to good standard. Wi-fi internet connection. Spa facilities include Pool, Jacuzzi & Sauna free of charge. Predela is ideally situated only 5 minutes walk from the gondola station. I deally located to ski back down the ski road & almost into the complex. Ground floor 2 bed apartment., with use of sauna and jacuzzi, Ski / snowboard locker room. Can be twinned with other properties in block for larger parties. Close to local restaurants etc. Use of facilities in Hotel next door for small fee. We found 23 holiday rentals in Pirin/Rhodope Mountains.